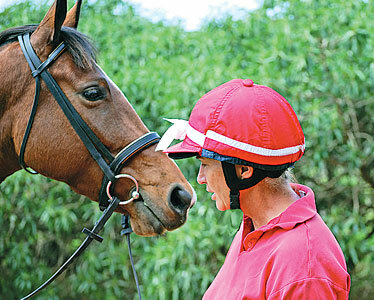 The Hawaii Horse Journal covers such issues as animal psychology, horsemanship and breeding. It was out of frustration that Sarah Blanchard started the publication Malama Lio, The Hawaii Horse Journal. In an attempt to sell a horse saddle last fall, she found that there were few avenues to connect with the greater community of horse owners and riders in the state. There are an estimated 10,000 to 12,000 horses in Hawaii, with two-thirds of them used for recreation and the remaining as working ranch horses, said Blanchard, the publisher and editor of the Malama Lio journal. Blanchard recognized an untapped niche and decided to start up the first horse-related journal Hawaii has seen in more than 10 years. It is a 12-page, black-and-white publication at the moment, but Blanchard has plans to take the journal up to 30 or 36 pages if reception is favorable within the horse-loving community. Introduced in March, she said, "it's still sort of a novelty." New editions are published the first week of each month, and 25 distributors on the major islands have agreed to pick up the publication, which covers issues such as animal psychology, horsemanship, breeding and agriculture sustainability. A business professor with the University of Hawaii at Hilo, Blanchard also is the author of three books on horses and horse training. "Horses are a part of our culture in many ways," she said, adding that despite the large number of horse owners, Hawaii remains the only state without an organized horse council. That could become her next project. To subscribe: By first-class mail, send name, address and a check for $24 for a yearly subscription to Malama Lio, P.O. Box 11511, Hilo, HI 96721. For a free electronic subscription, visit www.malama-lio.com or call (808) 969-3608 for area distributors. » Waimanalo Feed Supply, 41-1521 Lukanela St.